Hydro, aka BF Oxbow Hydro, is a handsome, 2-year-old red male born November 6, 2005. 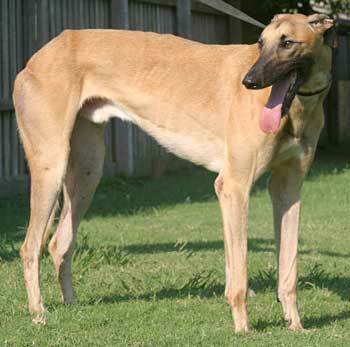 His sire is Flying Hydrogen, making his grand sire Kiowa Sweet Trey, and his dam is BF Angie. 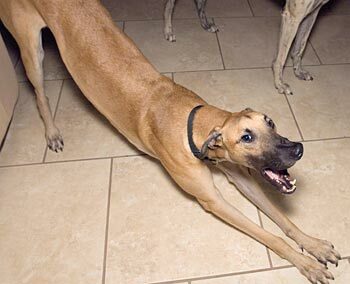 Hydro has no races listed on Greyhound-Data.com. He was surrendered to Tri Cities Shelter, because the man said he was too "happy" to race...so guess his name should be Happy Hydro! 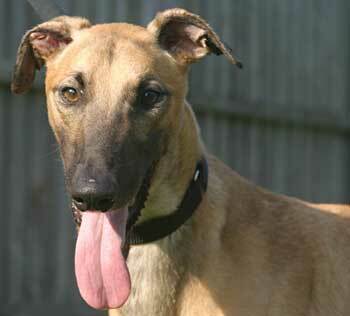 He is a very, very affectionate greyhound who gets along well with other greys. Results of Hydro's cat test: Hydro was curious about the cats. He saw the big kitty, Pepper, first and did not have much interest in her. He sniffed her and walked away. He seemed to be a little more interested in Molly, but just sniffing. Molly did not act afraid of him and did not run away, but she did hiss at him and gave him a couple of good swats on the muzzle. After that Hydro did not want to go by her again. I would say that he is cat trainable. As always Hydro will need to be watched and told "No Kitty!" if and when he shows any interest. Hydro is a big, happy, 2-year-old, with probably 6 months or so left of "puppy" in him. He doesn't seem to have an aggressive bone in his body. 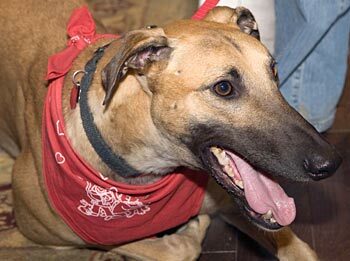 He gets along well with our other dogs (4 greyhounds). He doesn't seem to even notice when they give him the 'what for' when he invades their personal space a little too much. He and our smallest greyhound, Kaide, seem to really enjoy one another, and can frequently be found napping on the same dog bed, curled around each other. He tries lying down with the other male dogs, they fuss, he doesn't react, they fuss, he still doesn't react, they fuss yet again and usually walk off in disgust. Hydro then claims the 'empty' bed. Hydro loves to romp and play outside with tennis balls and stuffie toys. He loves to throw the toys up in the air and catch them, and he sometimes gets so excited when toys are thrown for him, that he just takes a couple of fast laps around the yard! Hydro likes being in the same room with people, but he sometimes decides to nap in another room. He loves attention from people, and occasionally tries to sneak up into a lap, but of course he is way too big for that! He is crate trained and even seems to enjoy it. Hydro's foster dad works from home, so someone is home with him most of the time. When we both leave the house, we crate Hydro with a chew toy, and he amuses himself and naps until we return. Hydro is learning to "sit" with a little encouragement, and usually comes when he is called. He is also learning "no," although he has to be told it in a firm manner. He learned how to use the doggie door quickly. 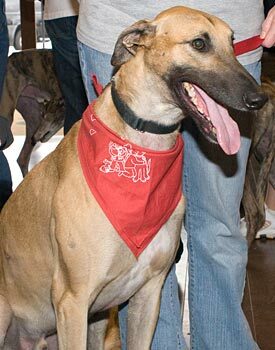 Hydro is a greyt ambassador for the greyhounds: at the Meet and Greets, he can usually be found near the entrance, greeting each newcomer enthusiastically and welcoming pats from anyone. He seems to get along fine with children and with small dogs, too. He plays very well with our daughter's 35-lb. mixed breed, and they wear each other out playing chase!